Greece — the queen of magnificent beaches and breath-taking landscapes. Three Sea, many islands with unique natural landscapes and a variety of beaches on them — wealth of Greece, with whom there is nothing comparable. On the Greek island everyone can find their paradise on earth. You doubt it? Then meet — the best beaches in Greece! The best beaches in Greece! A delightful meeting place of three seas. 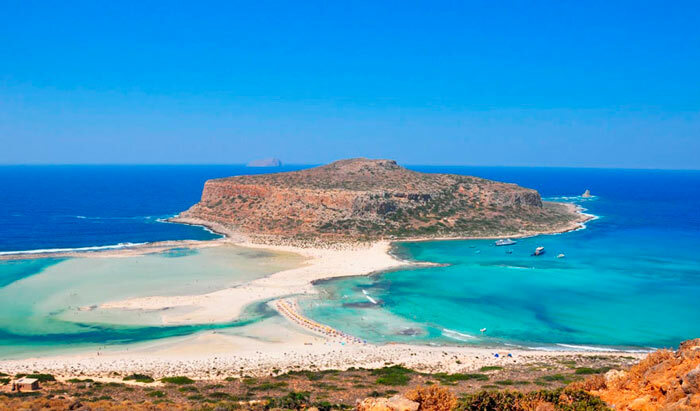 It can be called Balos — one of the best beaches in Greece. It is located in a cozy cove surrounded by mountains on the island of Crete. It can count a wide variety of shades of the sea, and the temperature in different parts of the beach can be different, which is not surprising for a place where water merge together the Aegean, Ionian and Libyan Seas. Balos Beach — a wild, infrastructure as such is not, except recently appeared a small amount of sun loungers. Buy water or food does not get here, you need to take everything with you. Place a bit hard to reach. Options to get into the bay two: by car or with a tour. By car you have to go up a steep serpentine road, but you can look down on the coast and reach glance once all its splendor. In addition, if organize such a trip before the start of the tourist season or after it, you can get the maximum range of sensations, not oiled bustle. A trip with a tour often involves not only the Bay of Balos, and other places of interest.